Moved here from Messages to people currently present in the Library. This may be a very elementary question, but is there a reference to a standard "set" of moves to set up an opponent into a ladder. For example, how to approach a single stone to do it. Another problem, when approaching the 4-4 point before, I would be concerned about which side of the board I would like to stake out as my own. Now I see I need to think about which side of the 4-4 to play, and whether it is low or high to determine which way I approach the opposing 4-4 corner. Wow - smack on the side of the head - This is Fun. Maybe I need to play in the center so I don't need to worry about this! Charles As for ladder strategy, that to some extent still seems to be a 'trade secret': no one really writes it up. One idea that recurs is this: + is the most severe of all the double approach to 4-4 combinations. Therefore White would often choose one of those plays as ladder breaker in this corner. 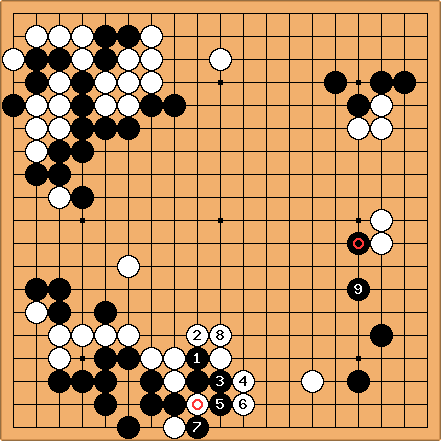 This you can see in games of Go Seigen, Cho Hun-hyeon, Cho Chikun, amongst other greats. kritz thanks Charles - your trade secret comment makes me think I asked the right question. Looks like it is time for me to review some games! kritz It looks like the pages attach-crosscut or atari-cross-cut? or cross-cut then extend page describe the basic set of moves. charles Are these what you were referencing as the "trade secrets"? Charles Not really: there are a number of such standard shapes, but I was thinking about the strategies for exploiting a ladder when it's there. Charles An instructive example from the recent opening game of the 28th Meijin match. Black was Yoda Norimoto, White Yamashita Keigo. 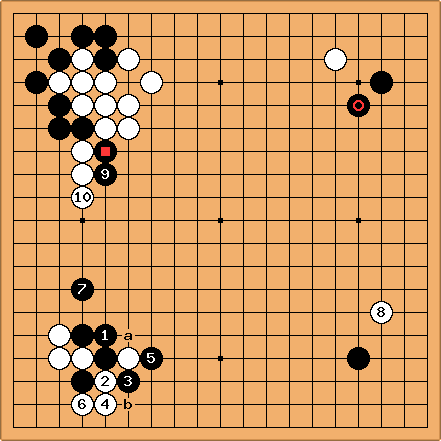 White initiated the taisha in the lower left: that implies a number of ladder questions. The connection assumes a good ladder. The key point here is that not only makes a ladder for Black, it is hard for White to play a good ladder breaker against it. That explains . Normally Black simply captures at a. -Jasonred : Pardon my ignorance, but why capture at a, (normally)? Why not play a large net and go for more influence? -Alex: Good question, and one that most kyus probably wonder about. 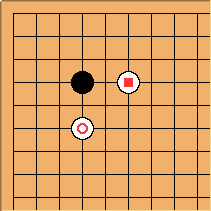 The short answer is that taking a ladder stone off the board and making a ponnuki almost always gives more influence, rather than less, than playing a close ladder breaker, since the latter will generally allow the opponent one or more forcing moves at some point. Here, it's an extreme example, as a close ladder breaker allows White to force at b, leaving Black very overconcentrated (because his ladder breaker is now uselessly close to a ponnuki) and open on the lower side. The only time I would resort to a close ladder breaker rather than the ponnuki is if the ladder breaker also served a fairly urgent dual purpose, like protecting a cutting point. Presumably White felt it was too passive to play to capture the cutting stone. Black fights confidently on the left side. 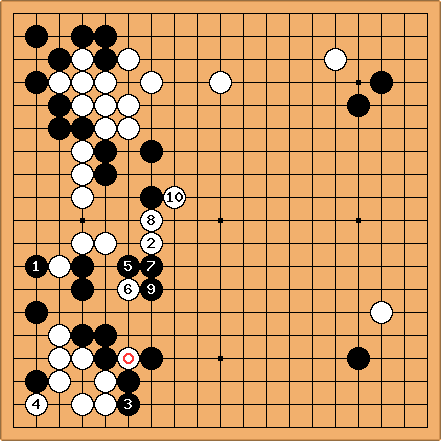 Black manages to capture as part of the fighting: quite a gain in efficiency. Inoue Ansetsu played the shoulder blow at to set up the cut at . Now White, Hayashi Genbi, could not capture in a ladder. Next, Ansetsu captured the stone in sente and came back to play . Note how the shoulder blow ( ) not only prevented the ladder, but also works with to reduce White's moyo.